We have mentioned many times on this website that we love photographing weddings in Philadelphia, Pennsylvania. Though we are based in Washington, DC, we have worked marriage celebrations in the City of Brotherly Love numerous times. We have enjoyed it so much that we have started thinking of ourselves as Philadelphia wedding photographers! The city has lots of great wedding venues — from swanky hotels to historic museums — and a wealth of lovely locations for couples portraits. Because we are primarily DC wedding photographers, those spots in Philadelphia are always fresh to us and inspire us creatively. That is one of many reasons why we look forward driving up to Philly to document a couple’s nuptials photographically. Like many a Philadelphia wedding photographer, one of our favorite spots in the town is the Philadelphia Museum of Art. It is arguably the most famous and easily recognizable buildings in the City of Brotherly Love. Interestingly, the most iconic part of the museum is not any of the exhibits featured inside. Instead, people from around the world immediately identify its front staircase. Why? The reason is those steps were the setting for a key scene in the 1976 movie, “Rocky.” The latter is one of the most critically acclaimed sports movies of all time. It is also a film that is very much about the city, culture and residents of Philadelphia. In the aforementioned scene, the protagonist runs up the steps of the museum and celebrates at the top. It is so iconic that the staircase has become known as the “Rocky Steps.” Visitors to the city unfailingly recreate the famous run and celebration when they come to the museum. A statue of the boxer that was used as a prop in the movie’s sequels sits in a park near the base of the steps. It came as no surprise to these Philadelphia wedding photographers that the museum’s steps have hosted other iconic installations. For example, the original home of Philly’s famous “AMOR” sculpture was at the top of the staircase. The artwork is based on Robert Indiana’s “Love” pop art image. The latter was turned into a sculpture that was subsequently reproduced and now decorates cities around the world. Versions exist in Hebrew, Italian, Chinese and Spanish. It is fitting that the City of Brotherly Love hosts two sculptures that remind visitors of its nickname. One of them — the one that graced the museum’s steps — is a Spanish representation. Amor is the Spanish word for “love.” It was loaned to Philly before Pope Francis visited the city in 2015 to honor the pontiff’s native language. Rendering the sculpture as “amor” instead of “love” had an added significance in the context of that visit. Amor also means love in Latin, the language of the Catholic Church. The installation was meant to sit outside the Philadelphia Museum of Art’s front door until early 2016. In a move that made many Philly residents happy, that decision was reversed. The sculpture was donated to the city of Philadelphia and relocated to Sister Cities Park. The latter is a short distance from the museum and, fittingly for the sculpture, faces the Cathedral Basilica of Saints Peter and Paul. As an aside, every Philadelphia wedding photographer is familiar with that house of worship. It is a gorgeous venue for Catholic marriage ceremonies! 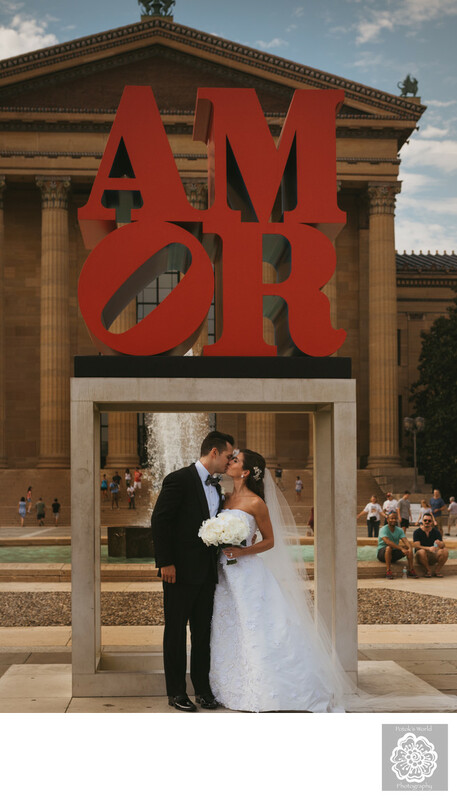 We took this picture of these newlyweds under the AMOR sculpture when it still sat atop the Rocky Steps. That is quite clear from the fact that the museum’s beautiful facade features prominently in the background. They had tied the knot at Our Lady of Good Counsel Church. Though this venue is not actually in Philly — it is in Moorestown, New Jersey -- the couple’s wedding was absolutely a Philadelphia affair. They were both from the City of Brotherly Love and had attended university there. They got ready and celebrated their reception at the opulent Union League of Philadelphia, an elegant private club. In recognition of their connection to the city, we wanted to give this bride and groom couples portraits with a Philadelphia flavor. Even though we are DC wedding photographers, we knew that the museum steps would be great for that. The presence of a sculpture dedicated to the very emotion they were celebrating made the choice even easier. The fact that the installation’s shape literally frames the subjects of the photo was a nice added bonus. The images that we produced of the newlyweds in front of the sculpture were some of our favorites from the day. Yes, they are just a little bit cheesy. But we think the sense of time and place the setting gives more than makes up for it. Location: Amor Sculpture, 210 N 18th St, Philadelphia, PA 19103. Keywords: Destination wedding (12), Philadelphia wedding photographer (3).